In this tutorial you will lean about Manual and Quick Additions – Adding Assets Manually, Quick Additions, Detail Asset Additions – Using the Asset Details Window, Using the Books Window, Using the Assignments Window and Using the Source Lines Window. You use Quick Additions to add assets manually. All assets added to the primary asset book are automatically converted to the reporting currencies asset books when you save transaction. Based on asset date placed in service, Oracle Assets retrieves an exchange rate to convert the asset cost and depreciation reserve. Using Quick Additions : Use the quick additions process to quickly add ordinary assets. 1. Assets that have a salvage value. 2. Assets with more than one assignment and with more than one source line. 3. Assets to which the category default depreciation rules do not apply. 5. Leased assets and leasehold improvements. 6. Assets assigned to warranties. Figure 1. Navigate to Quick Additions. 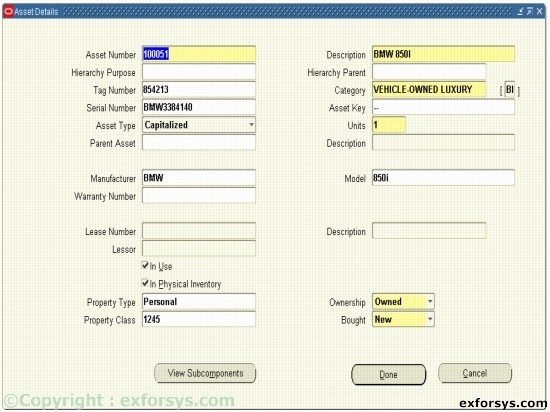 Asset Number : When adding an asset, enter the asset number or leave the field blank for automatic asset numbering. Enter a unique asset number, not in the range reserved for automatic asset numbering. Description : Use values defined in the QuickCodes window or enter your own description. Category : Group assets sharing financial accounts and usually depreciate using the same rules. Tag Number : Enter a unique tag number. 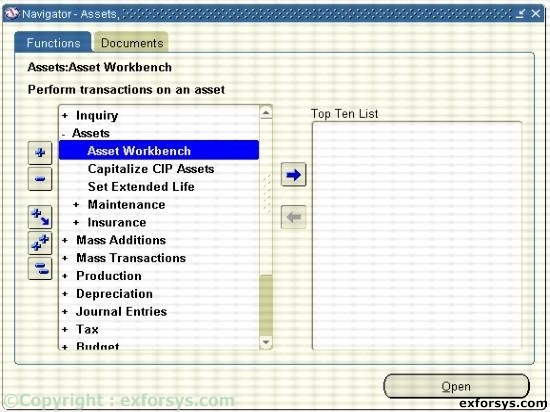 Asset category descriptive field : For each asset category, you can set up a descriptive flexfield for additional information based on the asset category you enter. 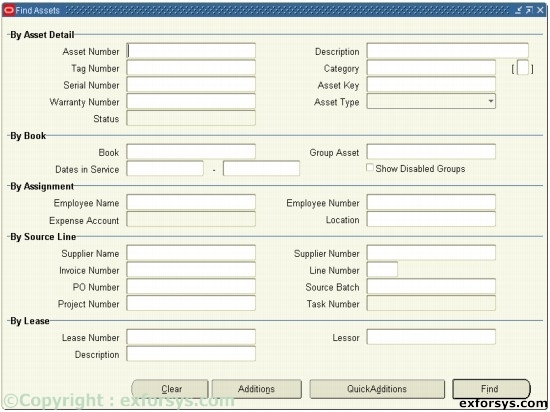 Asset Key : Group or identify groups of assets quickly. Even without financial impact, using this tracks assets groups differently than the asset category. Asset Type : Valid assets types are capitalized, construction-in-process, and expensed. Units : Represents the parts of an asset and groups together identical assets. Book : An asset must belong to only one corporate depreciation book. Assign a new asset to a corporate depreciation book before assigning it to any tax books. Costs : The current cost can be positive, zero and negative. Date placed in service : If the current date is in the current open period, the default date placed in service is the calendar date you enter the asset. If the calendar date is before the current date of the open period, the default date is the last day of the open period. Depreciation Expense Account : Assign assets to depreciation expense accounts. Oracle Assets charges depreciation expense. Using the Asset Details Window : Enter descriptive information in the Asset details window to query assets at a future time. Using the Books Window : Enter financial information in the books window. Using the Assignments Window : Enter distribution information in the assignments window. Using the Source Lines Window : Optionally, enter purchasing information as needed in the Sources Lines window.